Instant Pot Sloppy Joes - Easy Pressure Cooker Recipe! Does it get any easier than Instant Pot Sloppy Joes? I don’t think so! This is an ideal pressure cooker recipe that’s gluten free, and way healthier than the Manwich version which has High Fructose Corn Syrup in the ingredients, you won’t find that here! This is an ideal weeknight dinner, so when you are frazzled at 4pm with no dinner plans you can still throw all the ingredients into your pressure cooker and before you know it you’re on your way to cooking your Instant Pot Sloppy Joes, your family will thank you later! I prefer to use a natural organic ketchup, it has a richer flavor and is not as sickly sweet as regular ketchup so I think it improves the overall flavor of the recipe. 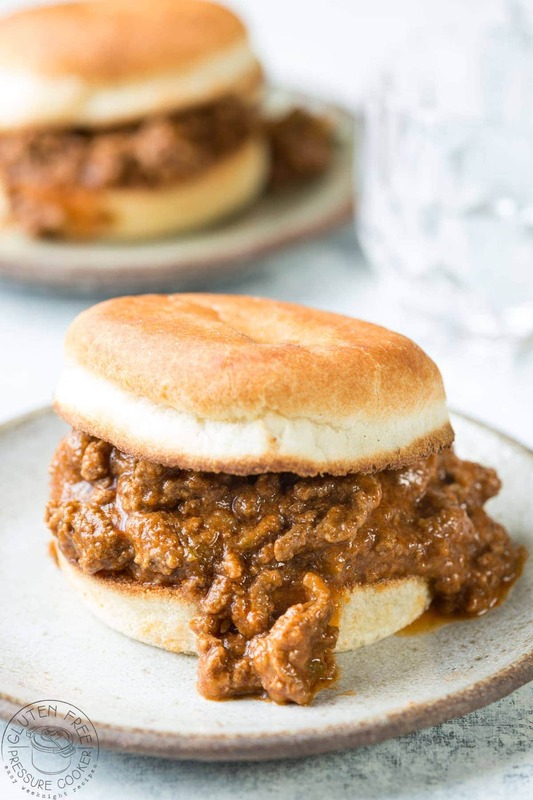 Instant Pot Sloppy Joes are meant to be sweet, that’s the nature of the original recipe, but you can control the sweetness by increasing or decreasing the sugar to your taste. You can make this a day ahead and keep it in the fridge then you can reheat it on the stove or in the microwave, I don’t recommend microwaving the buns though! Want a non instant pot version? 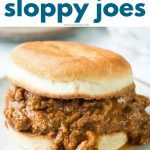 This Sloppy Joes recipe from Culinary Hill looks great too. Instant Pot– I have a couple of pressure cookers, but this Instant Pot Duo is the one I’d recommend you get if you don’t already have one! Cutting Boards – I love these cutting boards as I can rinse them and they go straight into the dishwasher when I’m done. Sheet Pan – I have several sheet pans, I don’t think you can have too many! This is great if you plan to toast multiple buns for this recipe. 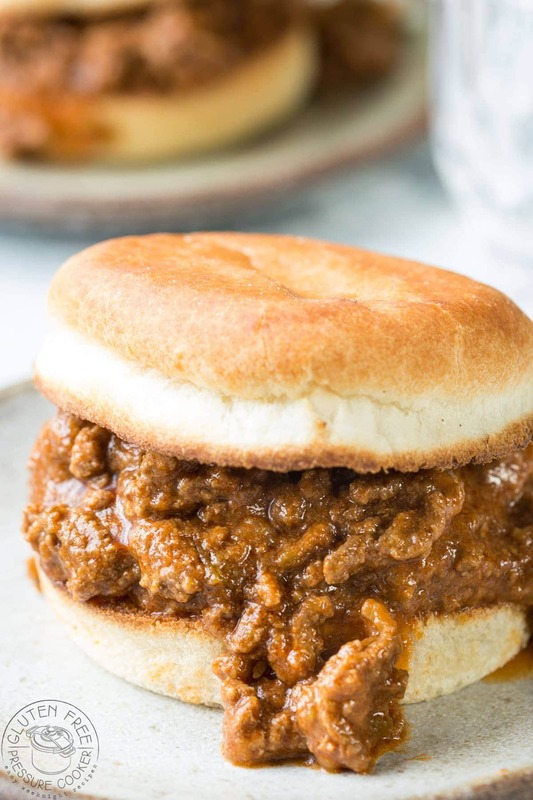 Instant Pot Sloppy Joes, this recipe is a firm family favorite! Don't miss my recipe video! you'll find it after the directions. Turn on the saute function in your Instant Pot or pressure cooker and add the oil and then cook the onions and bell peppers until soft, takes about 5 minutes. Add the garlic, salt, sugar, mustard, Worcestershire sauce, and stir well. Next, add chicken broth, apple cider vinegar and stir in the ground beef, make sure you add it in broken up into pieces, not in one big slab. Then add the tomato paste on the top and stir. Lock the lid, turn the steam vent to 'sealing' and using the 'manual' or 'pressure cook' button, adjust it to cook for 10 minutes at high pressure. When the cook time time is up allow the pressure to drop on its own (NPR - natural pressure release) for 10-12 minutes, then release the rest of the pressure and open the lid. After you open the lid use a couple forks or this meat chopper tool to break up the meat some more, then add the tomato sauce and ketchup and stir well. Your Instant Pot Sloppy Joes will still be fairly liquid at this point, I find it's much more flavorful if you let it simmer on a low heat (I chose the lowest saute setting on the Instant pot) until the liquid reduces and it thickens up a bit, It took 15 minutes for mine to thicken. serve hot over toasted gluten free burger buns. They look fantastic! One question: in the ingredient list you have 2 pounds of ground beef. In instructions, you say to add beef and pork but there is no port listed in the ingredients. How much pork? That’s my mistake, it should just say beef so I’ve updated it now. the servings for all my recipes are on listed the recipe cards next to the cook time, prep time etc, it’s in small print so it’s easy to miss!